He’s not a wimp. In fact, anything but. He’ll out-lift you, even though he only weighs 140 pounds. He’ll out-run you, even though he’s in his early 70s. And, he’ll burn you out of the sauna, if you care to test him. (I don’t recommend trying this.) 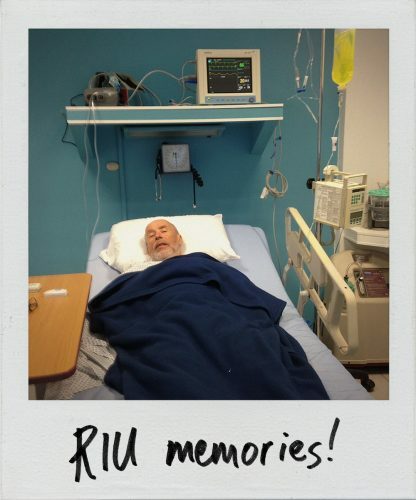 Even so, the RIU brand took my dad down. My folks visited RIU Emerald Bay in April. From all accounts, it’s a beautiful resort. Nevertheless, their vacation got cut short—due to bad design. Mom and Dad were making their way down from the lobby, when Dad took the last step on the staircase. It wasn’t just one step, though; it was two. He lost his footing, tumbled, and got hurt. After a couple of days of discomfort he met with an on-site paramedic, who didn’t think Dad had broken any bones. By the following day, however, the pain was so severe Dad met with a doctor who also recommended a visit to the hospital. It’s good he did. An x-ray revealed his rib was broken and the area surrounding it was getting infected. He spent a night there, before returning to the hotel. The rest of his vacation wasn’t great. He had to practice lung exercises to keep them functioning properly. The drugs he was prescribed gave him bad diarrhea. He had no appetite, and couldn’t sleep. What he could do, however, was chat with some of his fellow guests, while he recovered. As he did, he learned that others had fallen and were injured by the same confusing visual treatment. Even RIU staff members spoke of the issue with this staircase. They explained that visitors frequently hurt themselves on those steps. Think about that: An organization knowingly maintains a visual treatment that causes physical harm—because it’s a part of their corporate identity. (Talk about bad design.) They could have changed the look of those stairs. They could have marked those dangerous steps with warning/safety tape. Or, they could have lit the edges to make them safer for guests. They did none of this, though. One is left to think RIU management failed to act because they consider the look of these stairs more important than their guests’ well-being. What did they do? Well, Daniel (the hotel’s manager) offered my dad a free massage. Dad wasn’t so interested, though, given his broken rib. Beyond that, Daniel made himself scarce. He evaded discussion with my parents (presumably to mitigate responsibility on the organization’s behalf). After the trip, my parents reached out to RIU’s head office and asked them to make the situation right. A representative from RIU replied with a boilerplate-seeming email. In it she claimed that a “force majeure” caused the incident. When prompted with additional information and requests, emails ceased. This left my parents feeling crummy, as though RIU’s management had little concern for them or their other guests. To them, it seemed like RIU’s representatives were only concerned with avoiding litigation. Strong brands connect their values to their actions and messages. Patagonia is a fine example of this. Their people understand who—and why—they are. They then act and speak accordingly. A weak brand displays misalignments. You see this when McDonald’s releases a “healthy option.” Even if the food item is actually healthy, it rings discordant for a burger brand. When you prioritize how your company looks over your customers’ safety, though? That’s an altogether different matter. It’s not just a misguided brand strategy, it’s irresponsible. Your brand isn’t a design treatment—no matter how beautiful that design treatment may be. Your brand is the relationship your organization shares with each individual customer. In this case, RIU’s representatives provide an example of what not to do as you grow your brand. Don’t maintain a design treatment—no matter how pretty—if it harms guests. Don’t give wronged customers the runaround, to mitigate your responsibility. Don’t fake concern, while blaming Acts of God for your own negligence. Of course, RIU Hotels is a big brand, with 105 hotels in 19 countries. So, their people can act with impunity, for a while, and get away with it. Such acts can’t continue without consequence forever, though. And much bigger brands have fallen: Circuit City, Hummer, The Sharper Image, and Kodak once appeared unstoppable. Today, they’re just memories. Hopefully those stewarding the RIU brand take pause, and reexamine their values. Without such contemplation, they might share the same fate as those failed companies I mention above. For the rest of us, RIU’s actions serve as a cautionary tale. When you’re big, it’s all too easy to forget the one pivotal truth in branding: Your brand isn’t what you say it is. It’s what they say it is.